Under the auspices of Georgios Vidalakis, Professor at UC Riverside, a handful of graduate students visited Kearney to broaden their scientific knowledge and see examples of how individuals in careers such as their own can have an impact. The students were from a variety of disciplines including Plant Pathology, Microbiology, Entomology, and Botany. Vidalakis said that one reason he chooses to make the annual trek to Kearney is the great diversity of agriculture represented in this one field station. Their morning was spent in the field. Nematologist Andreas Westphal explained how he is saving years of research time by testing walnut rootstock against nematodes and for compatibility with commercial scion wood, simultaneously. Below. Andreas Westphal speaking to students. 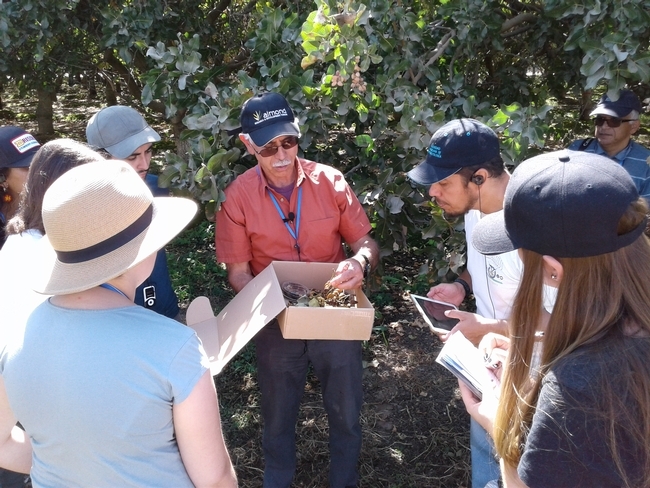 Themis Michailides, Plant Pathologist, showed the students samples of infected pistachios. Later he said of this, “The disease is anthracnose of pistachio caused by Colletotrichum fioriniae, according to Project Scientist, Paulo Lichtemberg. It is a new disease in California and caused major problem in a few orchards in Glenn Co. The same disease in 2010 destroyed 75% of the Australian pistachio crop. It is fortunate that the Kerman pistachio that is extensively planted in California shows more tolerance to this pathogen than the susceptible Red Aleppo cultivar. At present, we (with the lead of Paulo Lichtemberg) are doing epidemiological studies to determine conditions affecting the disease, evaluation of pistachio cultivar susceptibility to the pathogen, and fungicide trials to manage it.” Below. 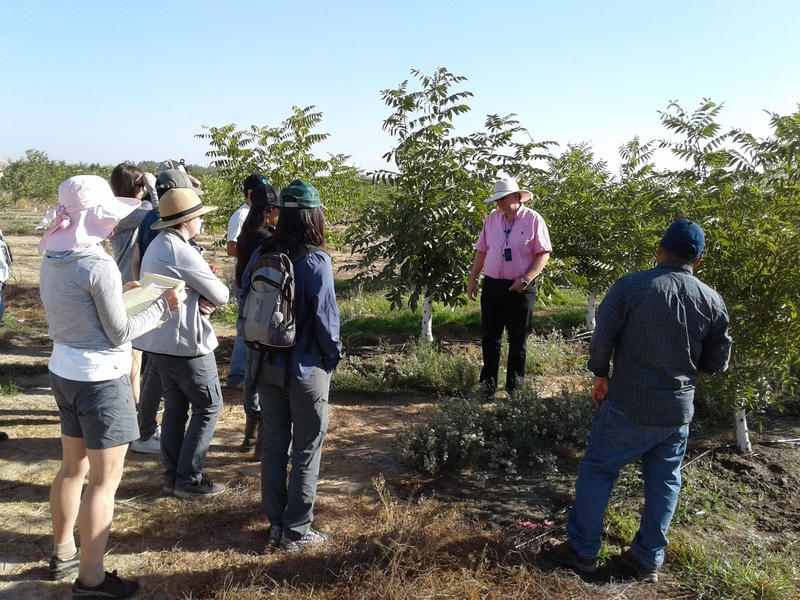 The students examined a novel trapping method for leaffooted bug as Entomologist Houston Wilson related control strategies for this emerging pest of pistachios. Below. After lunch, Leslie Holland, a Plant Pathology PhD Candidate working with CE Specialist Florent Trouillas, gave a presentation to students on the important role of plant disease diagnosis to growers and to research institutions. 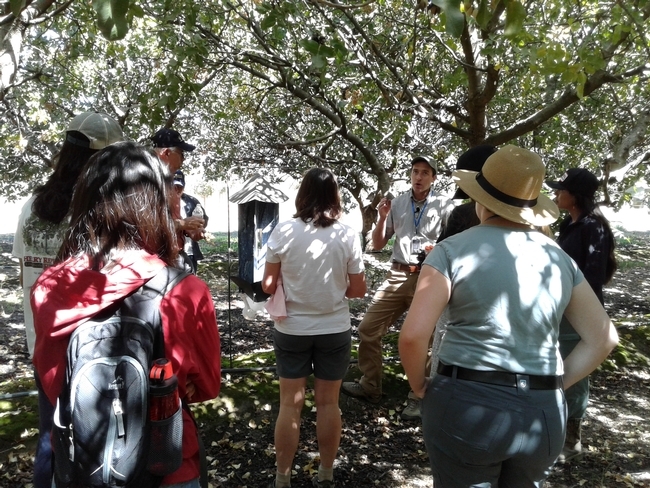 Holland spoke with students about emerging diseases in the fruit and nut crop industry in California and the research being conducted to manage these diseases. The group continued their day learning from Director Jeff Dahlberg how he and just six other people on the board of the Whole Grains Counsel developed the Whole Grains Stamp. The stamp, used to help consumers make healthy eating choices, is now on 12,000 different products in 58 countries. Vidalakis said that for the students to see firsthand the kind of influence a small group can have in the world was a “jaw-dropping” moment.